Once in Noventa Padovana, ancient river port of Padua, the boats stopped, the passengers and the goods reached Padua with the carts. The port lost its function with the opening of the Piovego canal, that allowed to arrive up to Padua. But many villas are the proof of the importance of Noventa. 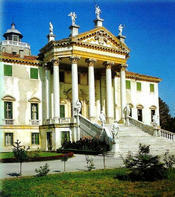 Among them villa Giovanelli, erected at the end of the 17th century by the Giovanelli's family, joins in its structure Palladian features and Longhena's new architectural tendencies. The exterior is impressive and spectacular thanks to the pentagonal pronaos, to the high Corinthian columns with the tympan , decorated with statues, to the Massari's stairway of 1738. In 1738 the villa welcomed Maria Amelia, the princess of Poland, who was going to Naples to marry Carlo Borbone, king of the two Sicilies. With Napoleon's coming the villa was confiscated as many other church goods. In the hall, on the first floor there are Giuseppe Angeli's frescos. He was Piazzetta's follower. The rooms' ceilings are decorated with paintings, framed with stuccoes. On the walls there are stuccoes and paintings with figures and landscapes. Unfortunately the great interior frescos concerning Antonio and Cleopatra's Love and the mythologic scenes were destroyed because they were considered too wordly when the villa became Giovanni Giovanelli' s property.